We let the tables and graphs speak for themselves. Anxiety over Spain’s ability to bring down the euro- region’s third-highest budget deficit after Europe handed Ireland an 85 billion-euro aid package has driven up financing costs for the country’s lenders already battered by rising bad loans and falling revenue. The average yield investors demand to hold euro-denominated Spanish bank bonds, relative to government debt, rose 117 basis points to 361 basis points in November -- the biggest monthly jump on record, according to data compiled by Bank of America Corp. As the cost of insuring the country’s debt against default rose to its highest level, Spanish lenders now pay the biggest premium ever on their debt relative to other banks in Europe. Spreads on Spanish bank bonds in euros rose to a record 147 basis points more than the average for all lender debt denominated in the currency, up from a gap of 63 basis points on Oct. 31, according to Bank of America data. It is time to have a deeper look at government deficits in the European Union, following the press release of the latest Eurostat data today and specifically the area which has been known as PIGS (originally termed by a German minister who looked like Groucho Marx) or PIIGS lately. 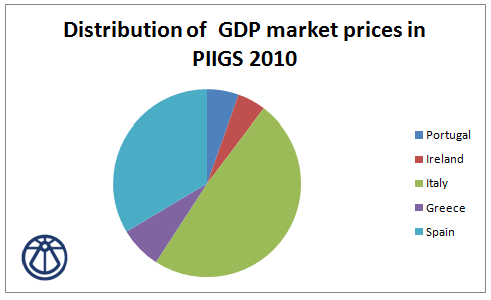 PIIGS is an acronym that refer to the economies of Portugal, Italy, Ireland, Greece, and Spain. Some of these countries have a high current account deficit relative to GDP. That is, they have seen large capital inflows in recent years, particularly from other countries such as Germany where investment opportunities are limited given the very poor performance of the German property market and the low yields available on German government bond markets.